Today am here to review a very unique and interesting product. It’s a ceylon tea body lotion! Sounds interesting, right? I haven’t seen a tea body lotion in any other brand. So when I saw this, I was tempted and also it was on 50% discount, so couldn’t resist adding it to my cart. Spa Ceylon is a new ayurvedic brand which originates from Sri Lanka. I have only tried their facial kit and totally loved it. I have also reviewed it here. 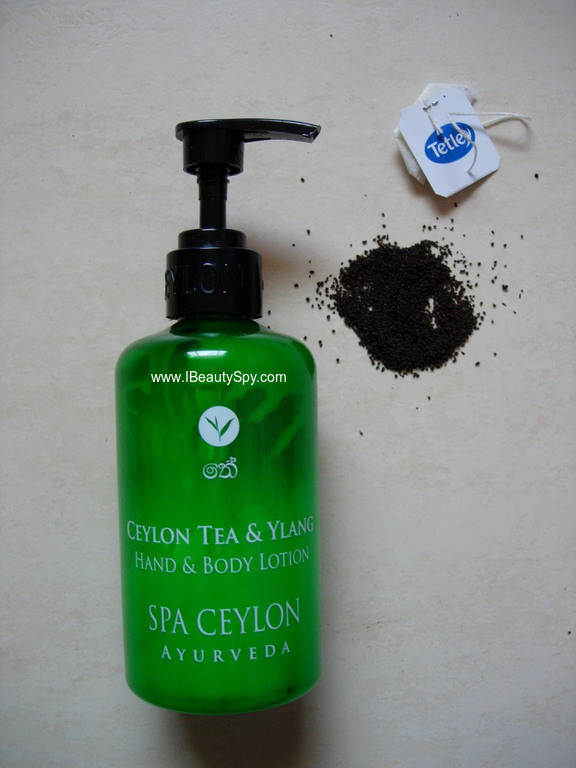 Did Spa Ceylon Ceylon Tea & Ylang Hand & Body Lotion live up to my expectations? Read on to know more. A light moisturiser infused with a naturally protective blend of Green, White & Black teas – rich in natural antioxidants and nutrients. Helps soothe and calm skin after sun exposure, while improving visible youthfulness. Virgin coconut, wheatgerm and sweet almond improve overall skin health and help nourish and hydrate, while rice bran, olive and honey soften skin against dryness. Enriched with mystical Ylang Ylang and sensual tuberose to help balance the senses and protect subtle energies. Spa Ceylon Ceylon Tea & Ylang Hand & Body Lotion comes in a green, transparent plastic bottle with a pump which is very convenient for dispensing the product. Spa Ceylon Ceylon Tea & Ylang Hand & Body Lotion is pale white in color with a very light brownish tinge. The consistency is milky and runny. It has an amazing scent of tea. If you have ever visited a tea garden or tea factory in a hill station, you would have been mesmerized with the scent of fresh tea leaves. That’s how this body lotion smells like. It envelops you in a soothing and relaxing scent of tea. The fragrance is little strong, so if you are not a fan of tea, I would advise you to skip this. 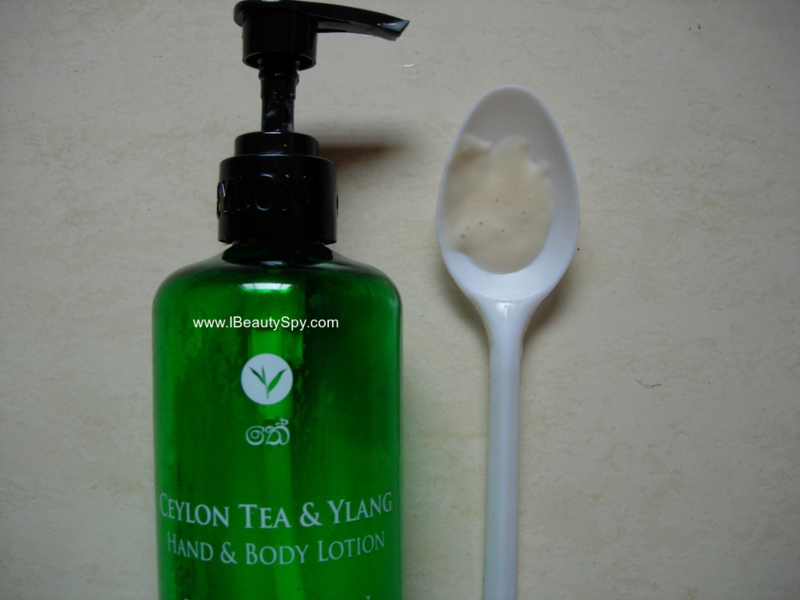 Spa Ceylon Ceylon Tea & Ylang Hand & Body Lotion moisturizes and conditions the skin deeply. It makes my skin smooth and soft with regular use. I have dry skin and light-weight lotions don’t work for me. Due to the presence of various oils, this lotion deeply nourishes my dry skin. It gets absorbed quickly without any greasiness. As claimed, it soothes and calms skin after sun exposure. Spa Ceylon Ceylon Tea & Ylang Hand & Body Lotion is free from parabens, paraffin, alcohol and is 100% vegetarian. It is cruelty free and not tested on animals. It also promotes sustainable harvesting and supports community fair trade. 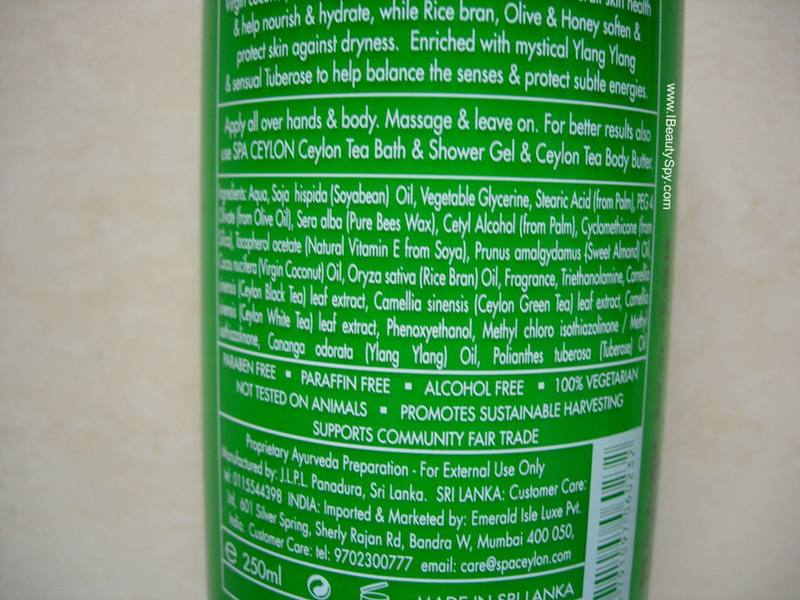 The ingredients list of Spa Ceylon Ceylon Tea & Ylang Hand & Body Lotion is what impressed me the most. Almost all of them are natural ingredients like various oils and tea. It does contain silicone but maybe in small amounts as I don’t feel the silky silicone feeling much. Yes, it satisfies all its claims, except I haven’t noticed any effect on visible youthfulness as such. That’s a tall claim for a body lotion 🙄. * Free from parabens, paraffin, alcohol and 100% vegetarian. * Amazing fragrance that makes you feel you are in a tea estate. * Soothing and calming to the mind. * Contains various oils like soybean oil, vitamin E, olive oil, sweet almond oil, coconut oil, rice bran oil, ylang ylang oil and tuberose oil which gives soft and healthy skin. * Contains ceylon black tea leaf extract, green tea leaf extract and white tea leaf extract which are rich in antioxidants. Yes, definitely, if you like tea and wish to splurge on a luxury spa product. Its definitely expensive. But Spa Ceylon is a luxury brand and you get a spa feeling from this product. 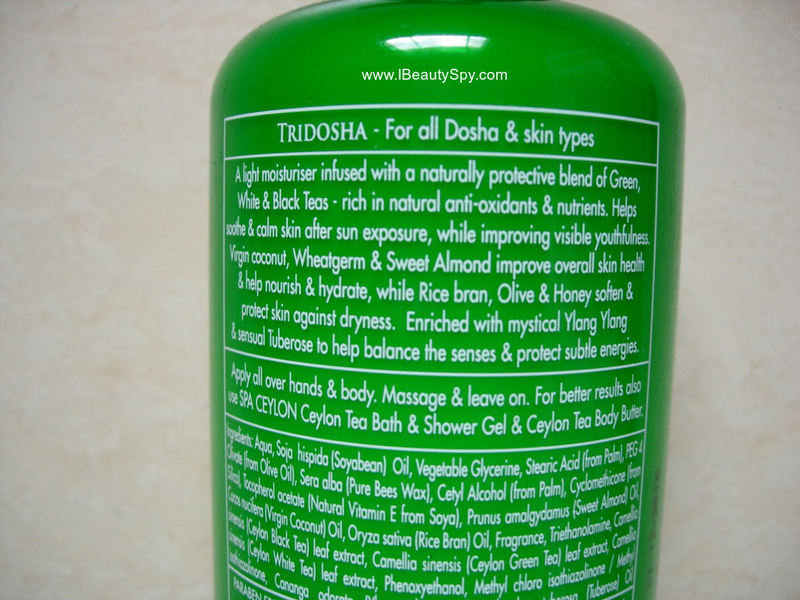 Also there aren’t other brands which retail a tea body lotion. So I wouldn’t mind shelling out some extra bucks for this natural goodness. I mainly purchased the Spa Ceylon Ceylon Tea and Ylang Ylang Body Lotion for the tea scent and it hasn’t disappointed me. The tea scent is actually more than I had imagined. Very fresh, soothing and calming to the senses. Also, we all know tea has great antioxidant properties which are good for aging skin. So I wouldn’t mind splurging on this product again. Though expensive, this looks like a good product. I’ve only tried their foot scrub and loved using it. Great review. Nice and detailed review , the product is good but expensive . I got a sample from Smytten for this brand and loved it. But not this one I think. A bit pricey but seems worth it. Nice and indepth review!! This is the Best Natural Skin Care Body Lotion. This is the Best Natural Body Care and Skin Care Body Lotion.